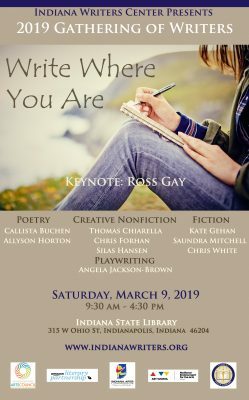 Join the Indiana Writers Center at the Indiana State Library when Indiana’s best established and emerging writers will meet for a full day of classes on the writing craft. Featuring a keynote address and master class from award winning author Ross Gay, and breakout sessions in poetry, fiction, creative nonfiction, and playwriting presented by Callista Buchen, Thomas Chiarella, Chris Forhan, Kate Gehan, Silas Hansen, Allyson Horton, Angela Jackson-Brown, Saundra Mitchell and Chris White. You’ll leave full of inspiration, armed with writing drafts ripe for experimentation—along with a hundred other writers who feel the same way. The Book of Delights is a book made of the daily practice, or discipline,of attending to one’s life. This talk will wonder about how such looking might open windows.